The archducal hat (German: Erzherzogshut) is the insignia of the Archduchy of Austria, mostly apparently symbolic and used in the heraldry and some portraits of Austrian archdukes rather than routinely worn. One late example is kept in Klosterneuburg Monastery. The first archducal coronet (Erzherzogskrone) was shown on a portrait of Rudolf IV, Duke of Austria, though this coronet probably never existed. Ernest the Iron (1377–1424) had a coronet made, and another was made on the death of Archduke Ferdinand II of the Tyrol in 1595. The final crown of the Archduchy of Austria was made in 1616 for the regent of the Tyrol, Maximilian III. Its place of production remains unknown. It is kept at Klosterneuburg Monastery in Lower Austria. It was brought to Vienna in 1620 for the Ceremony of Homage by the Estates (the so-called Erbhuldigung) for the new ruler, and was last there in 1835. Margaret of Austria, aunt of Emperor Charles V and Regent of the Netherlands, is also shown wearing one on her tomb by Conrad Meit and in some images. Since one had to be made for her funeral, she probably never wore a version while alive. Hers is a plain uncovered hoop with large zig-zag projections upwards. An archducal hat of Tyrol was made for Maximilian III, Archduke of Austria in 1602 and is kept as a votive offering at the church of Mariastein in Tyrol. Another example (the archducal hat of Joseph II) was made for Joseph II in 1764 for his coronation as Holy Roman Emperor in Frankfurt, of which only the metal frame remains today. 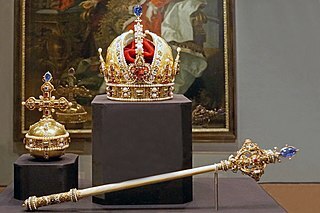 Another insignia of the Habsburg rulers is the ducal hat of Styria, which is kept in the Landesmuseum Joanneum in Graz, Styria. The coat of arms of the federal state of Upper Austria features the archducal hat on the top. It formerly appeared on the coat of arms of Lower Austria, until 1918. G. Kugler, Der österreichische Erzherzogshut und die Erbhuldigung, in: Der heilige Leopold, Ausstellungskatalog, Klosterneuburg 1985. Saint Leopold III, known as Leopold the Good, was the Margrave of Austria from 1095 to his death in 1136. He was a member of the House of Babenberg. He was canonized on 6 January 1485 and became the patron saint of Austria, Lower Austria, Upper Austria, and Vienna. His feast day is 15 November. The Treaty of Neuberg, concluded between the Austrian duke Albert III and his brother Leopold III on 25 September 1379, determined the division of the Habsburg hereditary lands into an Albertinian and Leopoldian line. Inner Austria was a term used from the late 14th to the early 17th century for the Habsburg hereditary lands south of the Semmering Pass, referring to the Imperial duchies of Styria, Carinthia and Carniola and the lands of the Austrian Littoral. The residence of the Inner Austrian archdukes and stadtholders was at the Burg castle complex in Graz. Maximilian III of Austria, briefly know as Maximilian of Poland during his claim for the Throne was the Archduke of Further Austria from 1612 until his death. The ducal hat of the Duchy of Styria is a jagged crown made out of silver-gilt. Believed to be produced in the 15th century, it was refashioned with pearls and enameled in 1766. The Duchy of Styria was a duchy located in modern-day southern Austria and northern Slovenia. It was a part of the Holy Roman Empire until its dissolution in 1806 and a Cisleithanian crown land of Austria–Hungary until its dissolution in 1918. This is a list of the Austrian empresses, archduchesses, duchesses and margravines, wives of the rulers of Austria. The monarchy in Austria was abolished at the end of the First World War in 1918. The Royal Monastery of Brou is a religious complex located at Bourg-en-Bresse in the Ain département, central France. Made out of monastic buildings in addition to a church, they were built at the beginning of the 16th century by Margaret of Austria, daughter of the Holy Roman Emperor Maximilian I and Governor of the Habsburg Netherlands. The complex was designed as a dynastic burial place in the tradition of the Burgundian Champmol and Cîteaux Abbey, and the French Saint-Denis. The church is known as the Église Saint-Nicolas-de-Tolentin de Brou in French. The archducal hat of Joseph II is an imperial insignia of Joseph II, Holy Roman Emperor. The archducal hat of Tyrol is an insignia of the County of Tyrol. It is located in the treasury of Mariastein.